Google has announced a software update for its UK-bound Google TV service, which incorporates the Android Market and Honeycomb OS for the first time. Google TV 2.0 opens up the service to third party developers via the Android Market, which means all existing applications can be rewritten for the TV screen and new ones can be created. With Google TV set to launch in the UK early next year, this opens the possibility for the likes of Spotify, BBC iPlayer, LOVEFiLM and Sky Go to have native applications for the service. In a post on the official Google TV blog, the company says: "We are opening up the TV to the creativity of content creators large and small through Android Market. "Android developers can now bring existing mobile apps or entirely new ones to TV. "Initially, the number of apps won't be large – apps requiring a touch screen, GPS, or telephony won't show up – but 50 developers have seeded the Market with cool and useful apps for the TV. We're excited to see the number of apps grow." 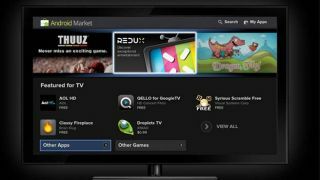 The new Google TV, which runs a variant of the Android Honeycomb OS seen on tablets like the Motorola Xoom, also has an overhauled, simplified interface which makes finding content easier. Another big improvement looks to be the YouTube app. Google says it has completely overhauled the way the video sharing portal works on Google TV, with the company also integrating YouTube into the system's content search. When Eric Schmidt announced Google TV would be coming to the UK, many felt that the horse had already bolted, following a disappointing reception in the US due to the lack of content available. With news that all content providers, as well as game developers can now push their wares using the service, it makes the Google TV proposition an entirely different and much more interesting one. We're actually quite excited now.